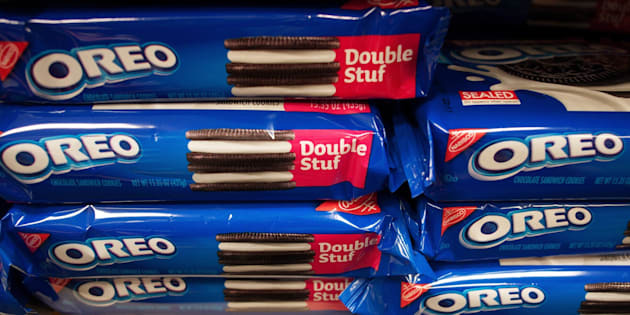 The snack conglomerate that produces Oreos offshored many of its factory jobs to Mexico. Last year, Michael Smith learned that his middle-class factory job on Chicago's South Side was headed to Mexico. The news stunned Smith. After all, his factory made an iconic American product: the Oreo cookie. Soon, real estate mogul Donald Trump took an interest in Smith's plight. Every chance he had, the front-runner for the Republican nomination pilloried Mondelez, the snack conglomerate that produces Oreos, Ritz crackers and other treats, for its decision to offshore the 600 Chicago jobs. Trump vowed never to eat another Oreo again. Then it was the campaign of Sen. Bernie Sanders, defending Smith and his colleagues from the left. Supporters of the Vermont independent held a rally outside the Mondelez plant in Chicago, demanding that the factory jobs stay put. A Sanders surrogate called the layoffs "an all-too-typical story about greed." Finally, Smith and his colleagues heard from Hillary Clinton. The factory workers got much more than just a shout-out from the presumptive Democratic nominee. In March, she personally visited Smith and six of his colleagues in an hour-long, closed-door meeting to talk about their layoffs. Clinton told the workers that she personally called Mondelez's CEO, Irene Rosenfeld, and urged her to keep the jobs in Chicago. "You could have felt the chill in the room when Secretary Clinton said she called Irene Rosenfeld," recalled Smith, a 59-year-old with five years at the plant. "That will be ingrained in my heart forever, wherever her campaign takes her." This election cycle, bashing companies that offshore work is the one thing the candidates have been able to agree on. Mass layoffs like the ones at Mondelez aren't exactly uncommon, but Americans take notice when jobs making what's been called "America's Favorite Cookie" are relocated to Salinas. Voters see robust corporate profits going to executives -- Rosenfeld raked in $19.7 million in total compensation last year, and $21 million the year before, according to the company's proxy statement -- and stagnating or disappearing wages for everyday Americans. Trump has become the presumptive GOP nominee by stating ad nauseum that deals like the North American Free Trade Agreement have devastated American workers -- even though the benevolence of free trade is part of modern Republican orthodoxy. Sanders, a self-described democratic socialist, has hung in with Clinton in a surprisingly competitive Democratic primary by hammering home more or less the same trade message as Trump. And Clinton, viewed by many on the left as weak on trade, is now promoting a tax plan that would claw back tax breaks for companies that offshore jobs. "Politics makes for strange bedfellows, doesn't it?" said Jethro Head, vice president of the Bakery, Confectionery, Tobacco Workers and Grain Millers International Union, which represents 4,000 Mondelez workers in the U.S. "Although [Trump] doesn't have the facts right, he has the issue right. We're tired of losing work to Mexico. We're tired of American companies sending products from Mexico back here for us to consume. There's not six degrees of separation on this. It's not even a degree. Everybody knows somebody who's lost a job that's been offshored." One day last year, a Mondelez plant manager in Chicago called a town hall meeting for all employees. According to Leonard Aiello, a mixer who made dough headed to the bake floor, the manager said the factory would lose several lines if the workers couldn't find a way to save the company $46 million annually on labor costs. That is, $46 million "in perpetuity," Aiello said. If they could sacrifice that much in pay and benefits, their jobs would stay, and the company would add more lines. If not, half the plant would be laid off the following year. Aiello considered the offer "ridiculous." "My own personal feeling was they were never going to put the lines here," said Aiello, a 57-year-old who had four years in at the plant. "What they wanted us to do and wanted us to agree to was not possible. It couldn't be done. I kind of got the feeling they thought we were stupid." According to Head, the offer was indeed not realistic. Shaving $46 million a year would have equated to a 60 percent cut in pay and benefits for the workers, he said. And even entertaining such a demand could have weakened the union's bargaining position with Mondelez and others. In fact, Head believes that was the motivation behind the company's proposal. The union was about to start negotiations for a master contract covering Mondelez workers around the country. The company may have wanted to see if the union would signal its willingness to make concessions before they were even at the table. In an email, Russell Dyer, a Mondelez spokesman, said that the company was operating "in a very challenging macro environment," and that it was focused on "improving the efficiency of all aspects of our business." He said Mondelez had pumped $450 million over the last four years into upgrading its U.S. manufacturing footprint, including adding new lines in New Jersey, Virginia and Illinois. He stressed that some Oreos would still be made at three other U.S. facilities, and that the Chicago plant would still employ 600 people. "Our Chicago bakery will continue to play an important role in our manufacturing network, remaining one of our larger manufacturing facilities in North America," Dyer said. That's little consolation for the half of the factory being laid off. In interviews with five workers who already lost their jobs, a few clear themes emerged. They all viewed Mondelez as a healthy company that doesn't need to move the production lines to Mexico, except to pad its profits. And they blame their predicament largely on a generation of policymakers who they believe have encouraged corporations to offshore production in order to cut costs. "How is this country going to survive if you keep taking all the good jobs overseas?" lamented Titus Banks, 52, who was among those laid off in March. "Why are the middle class cut out of being middle class, and the folks who are already rich are just getting richer?" The term NAFTA is practically a slur among the Mondelez workers. The 1994 deal, signed into law by President Bill Clinton, loosened trade barriers between the U.S. and Mexico, enabling American companies to seek out cheaper labor south of the border, and produce cheaper goods for American consumers. Smith said that as much as he appreciated the visit from Hillary Clinton -- "I thought it was a real class act on her part" -- NAFTA was very much on his mind. "We were aware that it happened under her husband's administration," he said. According to Smith, Clinton told him and the other Mondelez workers that she didn't succeed in getting Rosenfeld to reconsider the line closures. Clinton's campaign did not respond to questions about the call with Rosenfeld, or the meeting with the Mondelez employees. A Mondelez spokesman confirmed the phone call with Clinton, saying only that Rosenfeld "reinforced our commitment to the Chicago bakery and the U.S. market overall." To Laura Martinez, Mondelez's move to Salinas reflects the broader disappearance of decent blue-collar jobs that can sustain families. For eight years, Martinez worked in a plant for Bake-Line, the cookie and cracker maker. She was laid off from that job, and went to work at a Wrigley plant producing gum. She was laid off from that job, too, and went to work at Mondelez eight years ago. In March, she was laid off once again. She said she now wonders if any good work remains in American food manufacturing. "We have to pay the mortgage. We have to live," said Martinez, who is 52 years old and whose husband has bone cancer. "I'm already looking for a job, and a lot of companies only pay $12 an hour or $10 an hour. That's not enough." The union has launched a boycott of all Oreos produced in Mexico, urging buyers to check the label on boxes to determine where they were produced. (The union does not discourage people from buying Oreos still made in the U.S.) The boycott has been endorsed by the AFL-CIO, a federation of more than 50 unions. That makes for another case of strange bedfellows: The most prominent promoter of an Oreos boycott has been Trump. Organized labor on the whole has come out hard against the GOP front-runner and his brand of politics. And many of the Mondelez workers in Chicago happen to be Mexican-American, like Martinez. Trump has called Mexican immigrants "rapists" and "criminals," and demanded that a giant wall be built on the southern border and paid for by Mexico. Martinez said she harbors no ill will toward the Mexican workforce, especially as someone born in Mexico. "A lot of people there need jobs, too," she said. But she believes the workers there are paid at exploitative wages, while American workers like herself lose their wages altogether. "They want to pay workers two dollars an hour, and still send the product back to the United States," Martinez said. "Well, how are we going to buy the product if we don't have jobs?"